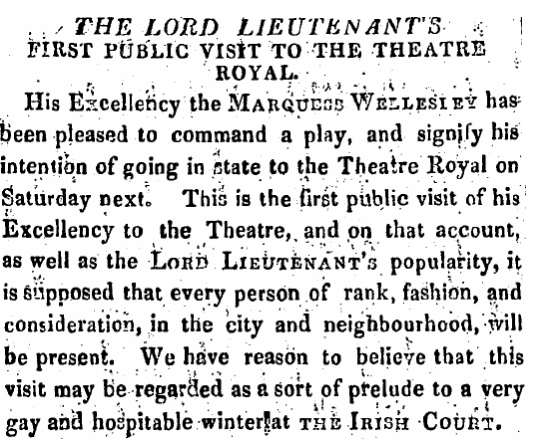 Trouble at the Theatre Royal, 1822. | Come Here To Me! Trouble at the Theatre Royal, 1822. Dublin has seen her fair share of disturbances involving theatres. From the famous incidents at the Abbey like the 1926 demonstrations at The Plough and the Stars, to an attempt by militant Suffragettes to torch the Theatre Royal, there are many stories of protest and outrage. This post looks at the attempt of members of the Orange Order to cause a sectarian riot in the Theatre Royal in 1822, during a performance that was attended by the Lord Lieutenant and others. On December 14th 1822, a performance of Oliver Goldsmith’s She Stoops to Conquer took to the stage at the Theatre Royal in Dublin. Among those in attendance was the Lord Lieutenant of Ireland, Marquis Wellesley, the brother of the Duke of Wellington. Wellesley was quite unpopular at the time among Orange Order members in the city, owing to what their perceived as he’s role in stopping an annual ceremony at the statue of King William of Orange on College Green, and other perceived concessions to the Catholic population. 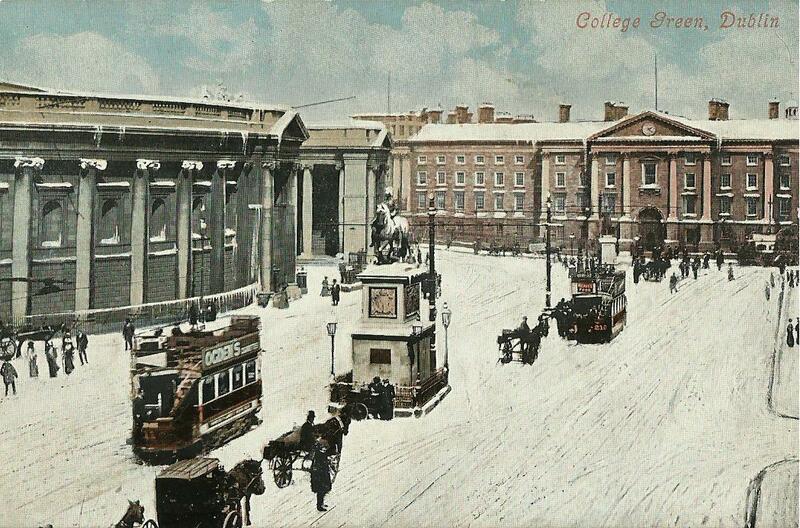 Undated postcard showing the monument of King William of Orange on College Green. This statue was the location for annual rituals organised by loyalist elements in the city, with events held in July (to mark the Battle of the Boyne) and November (to mark the birthday of William) a flashpoint on the Dublin calendar. The historian Shunsuke Katsuta has noted that it was common at this ceremony to “decorate the equestrian statue of William with orange symbols (‘dressing the statue’), with shamrocks strewn under the feet of the king’s horse, to symbolise William’s victory over Catholics.” Heavily criticised by Daniel O’Connell and other nationalist voices, Dublin Castle would distance itself from the ceremonies, but it was the eventual banning of the November ceremony which infuriated the Orange Order into action. An announcement that appeared in the Freeman’s Journal, December 1822. The conspiracy was hatched in the Shakespeare Tavern, on the edge of a grimy alley known as Leinster Market, directly across from the canopied state entrance of the Theatre Royal on Hawkins Street. Six men met in the tavern on Wednesday December 11th, all members of the Orange Order. John and George Atkinson, James Forbes, William Graham and Henry and Matthew Handwith drank to “the glorious, immortal and pious memory” of King William of Orange, plotting a protest against the Lord Lieutenant which would grab the attention of the city. On December 13th, a meeting of Lodge 1612 of the Orange Order on Werburgh Street decided to fund the purchase of twelve pit tickets for the upcoming play, with the aim of creating a scene which would embarrass the Lord Lieutenant. 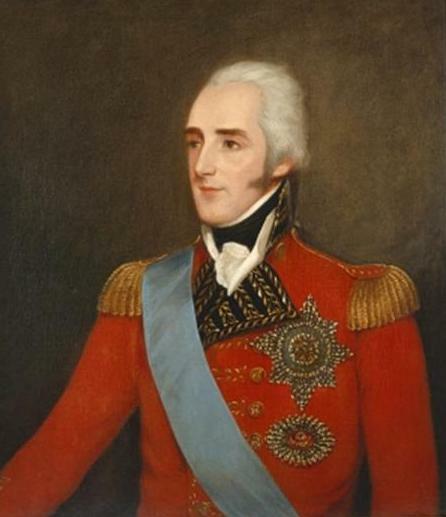 Richard Wellesley, 1st Marquess Wellesley. In reality, the trouble had begun inside of the theatre with the tossing of pamphlets with the slogan ‘No Popery’ upon them, most of which drifted towards the stage. There were some cries of ‘No Popish Lord Lieutenant’, and the Lord Mayor of Dublin was also subject to ridicule. Yet the play began as planned, only to be interrupted throughout. One rather comical intervention came as two characters sat down to a drink, with an Orange heckler encouraging them to drink the toast to “the glorious and immortal memory” of King William of Orange! The crowd also called on the cast to sing ‘God Save the King’, and a series of items were thrown in the direction of the Lord Lieutenant, including “the blade of a watchman’s rattle, an empty bottle, and an orange labeled ‘no popery'”. The event would come to known as ‘The Bottle Riot’ in Dublin, owing to the missiles thrown. While the Lord Lieutenant was never in any real physical danger, the incident was hugely embarrassing for the authorities, with mob rule taking centre stage at one of Dublin’s most prestigious venues. Several days later, the behaviour of the Orangemen was the subject of a protest meeting in Dublin. This meeting was significant as it was addressed by some hugely influential figures, including the Duke of Leinster, Daniel O’Connell, Henry Grattan jr. and Arthur Guinness jr, son of the famous brewer. Guinness denounced the men as a “mischievous faction” and called for them to be opposed “by the severe but wholesome discipline of the laws”. While the instigators of the affair were brought in front of the courts on two separate occasions (first tried on the grounds of conspiracy to murder and attempted murder, and later on the grounds of conspiracy to riot and rioting) both cases collapsed, causing much anger. Chief Justice Charles Kendal Bushe remarked to the jury in his summation that “an audience may cry down a play, or hiss, or hoot an actor”, but that riotous behaviour was not permitted. One effect of the mini-riot was the outlawing of the Orange Order for a period, when the Unlawful Societies Act of 1825 came into being. The Theatre Royal is no longer with us in any form, though the building in which the mini-riot occurred was destroyed by fire in 1880. The theatre which replaced it was demolished in the 1930s, and the third and final theatre would stand in the location until 1962. Today, the location is occupied by Hawkins House. 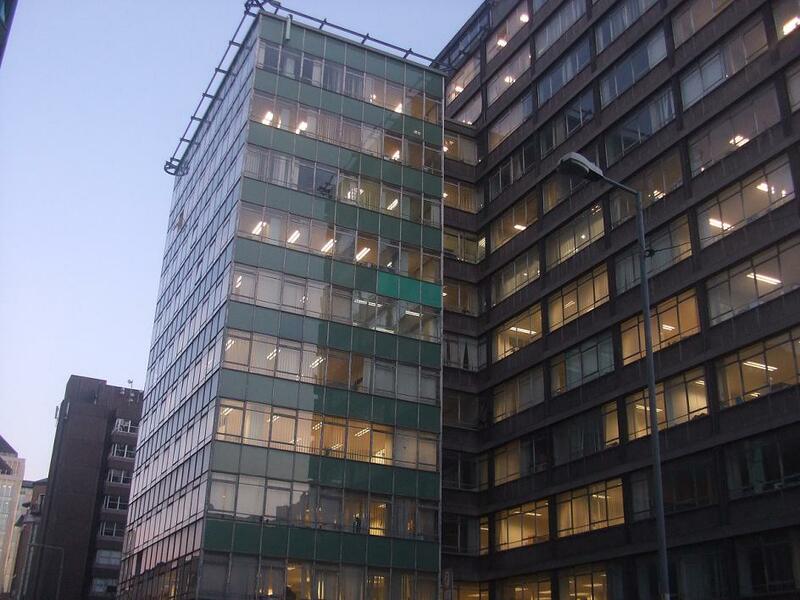 Check out Conor Doyle’s NearFM feature on the Royal, linked at the above url. did the orange order march in dublin after that?